There's something about mountains, he told his mom. Michael McMahan, 10, kept asking about the colors of mountains: the blues, the browns, the purple majesties. He stared for hours at pictures of mountains. Why does a child growing up in Kansas obsess about mountains? A mountain, he told his mom, is the closest place on earth to God. That's important to Michael, who is fighting an inoperable brain tumor that is stealing his dreams and his childhood. After a doctor told him he was dying, Michael began drawing pictures of mountains with pointy tops and layers of color; mountains with snowy white peaks. Last month Michael was offered a trip to the Rockies, but his doctors said no, it was too risky. Complications could develop from the thin air; the changes in pressure could cause more swelling. But wishes can come true, especially on Christmas. Because Michael couldn't go to the mountains, the mountains came to Michael. 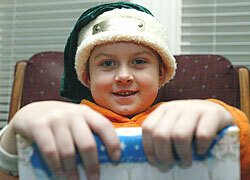 On Christmas Eve, Michael's mountains grew overnight in his bedroom while he slept nearby. It was a tall order, but not for the Elves of Christmas Present, hundreds of nameless souls who move mountains every year to make Christmas extra special for a few children. On Christmas Eve, the streets of Leavenworth are silent but not dark. Christmas lights twinkle from front doors, rooftops and living-room Christmas trees. At 1:15 a.m. a semitrailer chugs into the parking lot of the Valley View Apartments. Out spring dozens of men and women, some wearing red Santa Claus stocking hats, who gather around the McMahans' front door. "They're here," whispers Kris Petrone, a friend of the McMahans. "The elves are here." Terri McMahan quickly tiptoes upstairs and sneaks a peek at her four sleeping children. Michael is sharing a bed with Lance, 8, and Nicole, 7. Like baby bunnies in a nest, all three are sprawled in deep slumber. April, 9, is asleep in her room across the hall. A radio drones out Christmas carols where the three children sleep. The hope is that the radio will also mask the sounds of the mountains about to be born. In minutes the little town house apartment bustles with activity. "Shhh-h-h-h-h-h," sounds a chorus of elves to the others' giggling, when McMahan opens her front door. Six burley elves maneuver three canvas panels up the stairwell. Each panel is 7 feet 9 inches tall and holds a part of the mountain painting. Men wearing canvas aprons enter with drills and tool boxes. Women are armed with rulers and plastic evergreen trees. 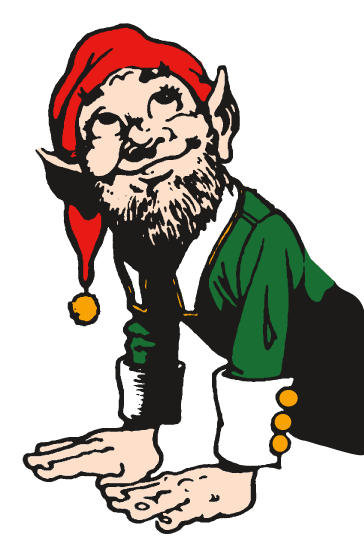 A tiny elf enters wearing a stocking cap that reads: "Rookie Elf." "This is my first time," the child says, with a giggle. But McMahan wears the biggest smile of them all. Dimples sprout from her cheeks deep enough to drop a nickel into. Each elf has a special task. Some elves are professional carpenters in their other lives. As one carpenter elf drills, he clasps his hand around the tool in a vain attempt to mask its noise. Zipfzzzt. Zipfzzzt. The drill bites into the white wall. "Is the next panel lined up straight?" he asks. "No, no, go lower," whispers a helper elf. "Lower, yeah, that's it." Other elves, who are electricians, stand by to install track lighting. Weeks earlier, business elves donated the track lighting equipment. Museum-expert elves, from the Nelson- Atkins Museum of Art, shared their expertise on how to illuminate Michael's Mountains with light. Artist elves from the Kansas City Artist Coalition spent a weekend painting mountains with layers of blues, browns and purples. Out of their brushes sprang mountains with pointy tops, mountains with snowy white peaks. The artist elves also added Michael himself to the painting. Said one artist elf days before this night: "We're inspired by Michael, so we put him in the painting, too." 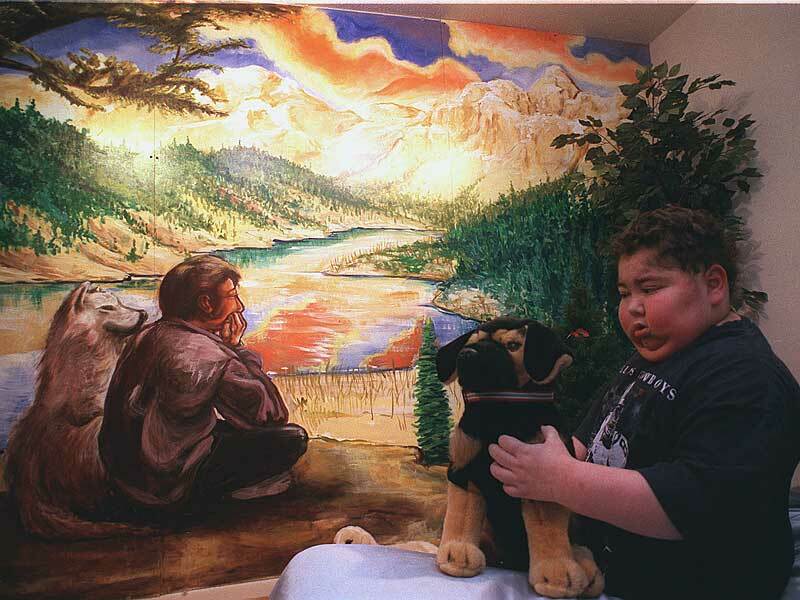 They also painted a wolf sitting next to him, because Michael had wanted a real dog. But the space of an apartment and the demands of his medical therapies would be cruel to an animal, said the elf artist. "The wolf represents strength and courage and great friendship," said the elf. "We hope he likes it." One elf looks on, quietly. His Santa hat is different from the others. 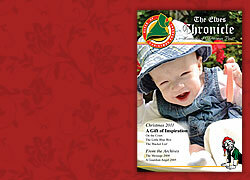 It's green, not red, and on its brim are the words "Chief Elf" embroidered in gold. He leans on a cane, bespectacled with a gray beard. With the weariness of the night showing in his eyes, he takes a deep breath before he says: "When you're 10 years old and dying, it's nice that people remember you on this day. Since we can, it would be immoral to not try." Chief Elf, an Olathe man who insists on anonymity, founded the Elves of Christmas Present 10 years ago as a way to teach his own children the true meaning of Christmas -- instead of the "gimme, gimmes" of the season. 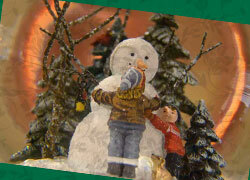 The group tries to make Christmas extra special for children who are very ill or who have lost a loved one. Last Christmas Eve the group converted a second-floor apartment into bedrooms for a family whose father had died a month before. This year they have made several other Christmas stops, in addition to building Michael's Mountains. Some families on their route received toys. One family's monthly mortgage payment was paid. One 16-year- old received a car. One little girl waiting for a double-lung transplant received a motorized wheelchair. 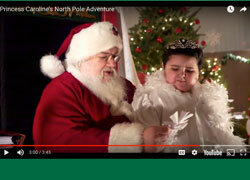 Although the Christmas magic is for the children, the elves say they receive the best gift. "I'll tell you what I tell all elves -- you'll never forget this Christmas," the Chief Elf says. "Years from now you'll forget what presents you received, but you won't forget this night." At 3 a.m. the last screw is in place, the last plastic tree adjusted to catch the light just so, and the sound machine that mim- ics a bubbling brook with birds singing is plugged in. "Merry Christmas," whispers each elf as they leave. And in a blink of an eye, the little apartment is quiet, save for the sound of the radio. The children sleep on. At 3:50 a.m. a mountain of wrapped packages waits under the tree. Terri McMahan, a single mother, sips another cup of coffee, waiting for her children's sleepy eyes to flutter open. "This is a special Christmas for us," she says. "It's probably going to be Michael's last." With Michael's diagnosis in July, doctors offered little hope. Modern medicine zapped Michael's brain with a lifetime dosage of radiation. He was given massive doses of steroids and other drugs. With the treatments, the chance existed that the brain-stem tumor might shrink. Without the treatments, he had no hope at all. "He knows he's dying," says McMahan, with a sigh. "We're all very open about it. It's just a waiting game now." The treatments had side effects on Michael. Radiation caused his right arm to go numb. Now he drags his left foot when he walks. He can't hear from his left ear anymore, and his pupils sometimes cross, giving him double vision. The drugs have also caused his weight to balloon from 55 pounds to 120 in just five months. "It tears me up to see his little body like this," his mother says. "Those little stretch marks...He can't walk hardly with all the weight. "He's my little hero. All the things he's gone through. He's my little man." Her words stop when a noise sounds. Michael stands before his bedroom, unsure of the scene before him. His right hand hangs limp on his hip. His left hand wipes the sleep from his eyes. In his bedroom, where a plain white wall stood before, mountains loom. Mountains with blues, browns, purple majesties. Mountains with pointy tops and snowy peaks. A little boy gazes out from the scene, with a wolf sitting next to his side looking on with tender eyes. "Mom, what's this?" asks Michael, as his words mumble into soft cries, then silence. He stares, now wide-eyed, looking from his mother to the painting and back again. "Michael, it's your mountains," McMahan says softly. "It's your mountains." Birds chirp. Water gurgles. Michael tilts his good ear toward the sounds. He stares again at the painting. He limps closer for a better view. "Are those trees for real?" he asks, looking at the plastic evergreen trees. "They are your trees," says Terri. "See the little birds in them?" Michael stares and stares. Nearby are two stuffed animals, gifts from some schoolchildren who heard his story from their art teachers. He pets the face of one stuffed animal, then stares once more at his mountains. "Isn't this awesome Michael?" says Terri. "Yeah...awesome," he says as he tilts his head to the top of the mural. He stares some more. Then, ever so slowly, a smile etches across his face.